We're waiting in the airport for our flight. I always post a picture in the airport. It's generally the least interesting of the trip. When we get to Taiwan, we will have some noodles while we wait for our connecting flight, and I will likely post a picture of that too. By the time we are in Taiwan, we will have bypassed Saturday altogether, and it will be Sunday morning. I don't really sleep on the plane--I zone out and listen to music. One we are in the air and settled, they will serve dinner, then dim the lights. Once the lights come back on, they will serve breakfast, and we will think about landing. Something like 14 hours. From Taiwan, it's only about 2 1/2 hours to Bangkok, then a taxi ride from one airport to the other, so we can take the plane to Malida's home town. We will arrive at her house about 27 hours from now. I took a nice nap this afternoon in anticipation of being up for a while. I miss my cats. 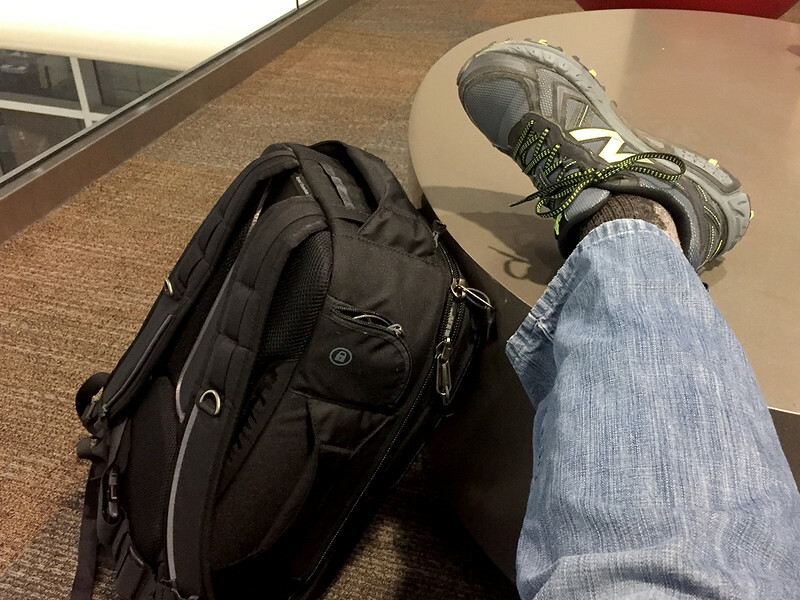 My left foot waits patiently for boarding.